These are Birthday Cupcakes for Mimi! They are white cupcakes with buttercream frosting, sprinkles and fondant details. This cake was for Delylah's 2nd Birthday. (There is an eiffel tower candle to go on top- picture it!) The cake is strawberry cake with buttercream filling, and hot pink buttercream frosting. The bows are made of fondant. Here is 2 dozen mini cupcakes for little Jackson's Birthday. They are white and chocolate cupcakes with buttercream frosting and fondant details. 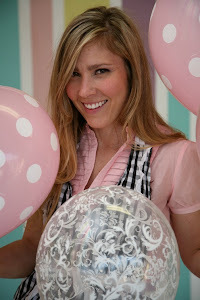 Here is 5 Dozen (although not all pictured) Lingerie inspired mini cupcakes for a bachelorette party! They are white, chocolate and strawberry with white and chocolate buttercream, with fondant details. 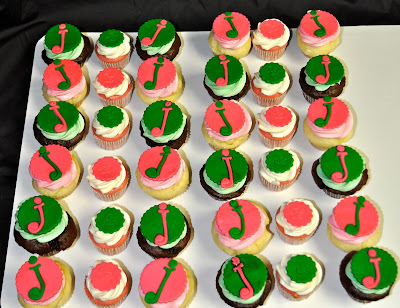 3 dozen mini "J&J" cupcakes for a wedding! The bridge and groom both have names that start with "J" and their wedding colors are pink and green. The cupcakes are white, chocolate, and strawberry with buttercream frosting. 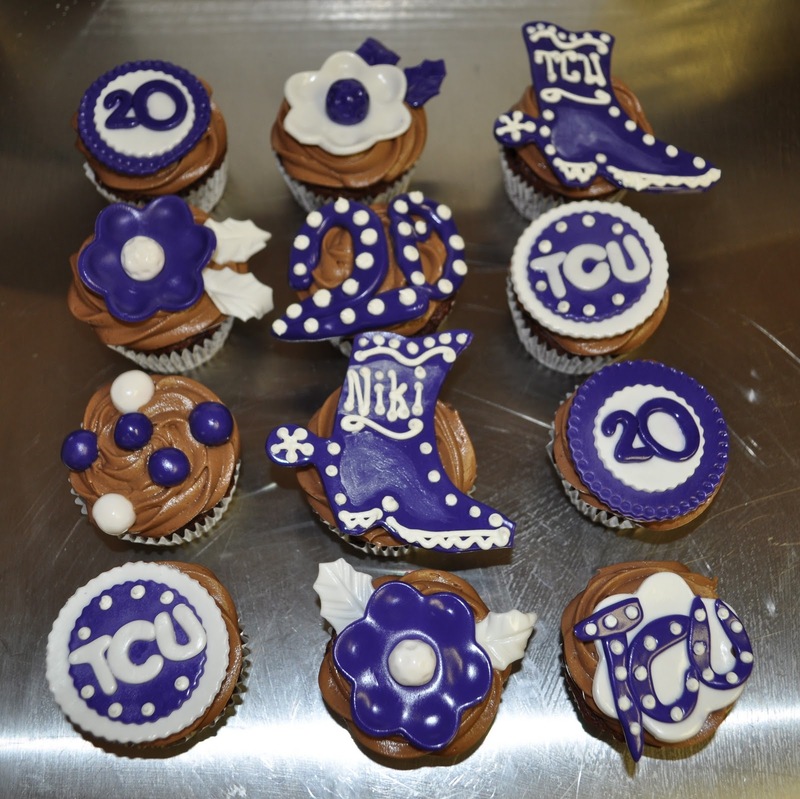 This is one dozen double chocolate cupcakes with TCU themed 20th birthday decorations! "i loved the cowboy boots!!!!! 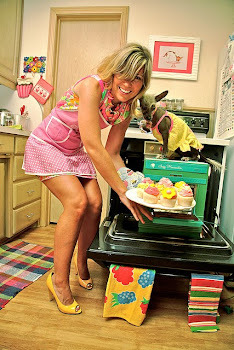 niki was tickled pink by her birthday cupcakes! thanks, j"
This cute little combination is a 6" Smash cake with 4 dozen matching cupcakes. 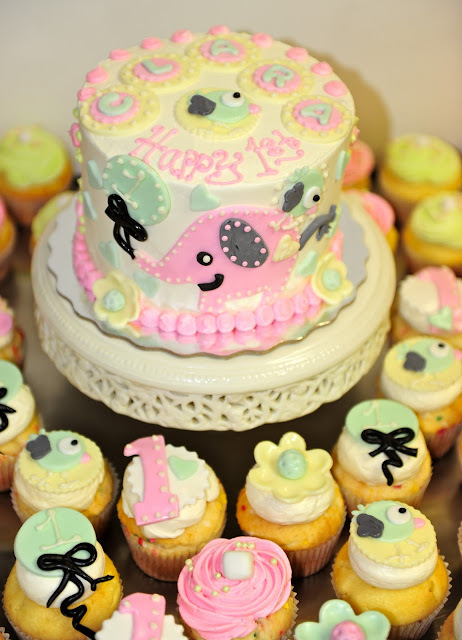 The cake is white with buttercream filling, the cupcakes are confetti and white. The theme was based off of the super cute invitation for the party! 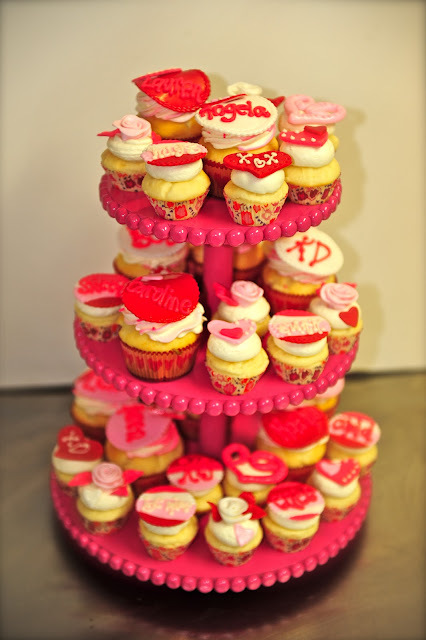 These cupcakes are for a Valentine's themed Tea Party for a group of 8 year old's! It is 1 dozen standard sized white cupcakes, with fondant decorations as their name cards for the table. The rest are 2 dozen matching mini's, white with buttercream, and cute little valentine's fondant decorations. 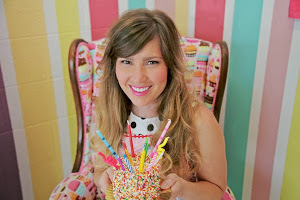 This was such a fun theme to work with for Ashleigh's first birthday party!! The cake is a 6" white smash cake with buttercream filling and frosting & fondant details. 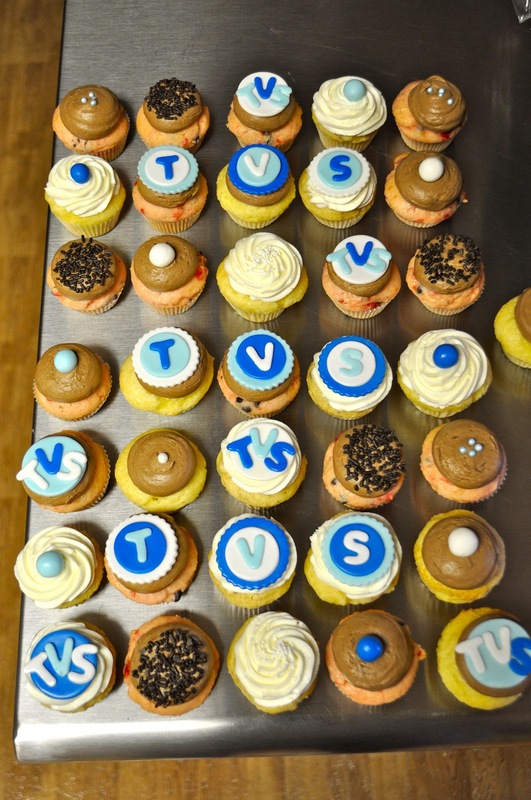 The cupcakes are 1 dozen white and 1 dozen chocolate with corresponding fondant decorations. The flowers and butterflies on the cake have been airbrushed. 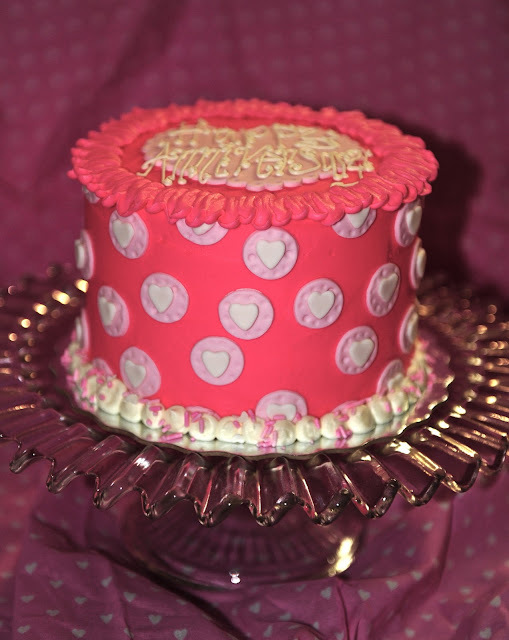 This little 6" is a Valentine's/Anniversary cake. 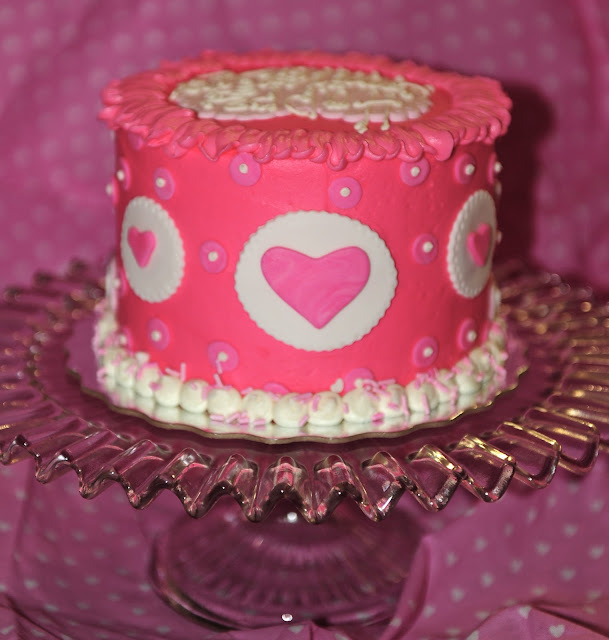 It is an almond cake with buttercream filling and pink buttercream frosting. It has fondant details. The cake is beautiful and it took all of my self control to not stick a fork into it. 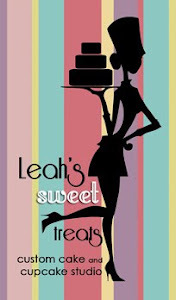 3 Dozen mini cupcakes for Trinity Valley's Teacher Appreciation Day. The cupcakes are chocolate covered cherry with chocolate buttercream, almond with buttercream, and yellow with chocolate and yellow buttercream. This is an 8" Red Velvet Cake with cream cheese filling, buttercream frosting, and sweet fondant details! 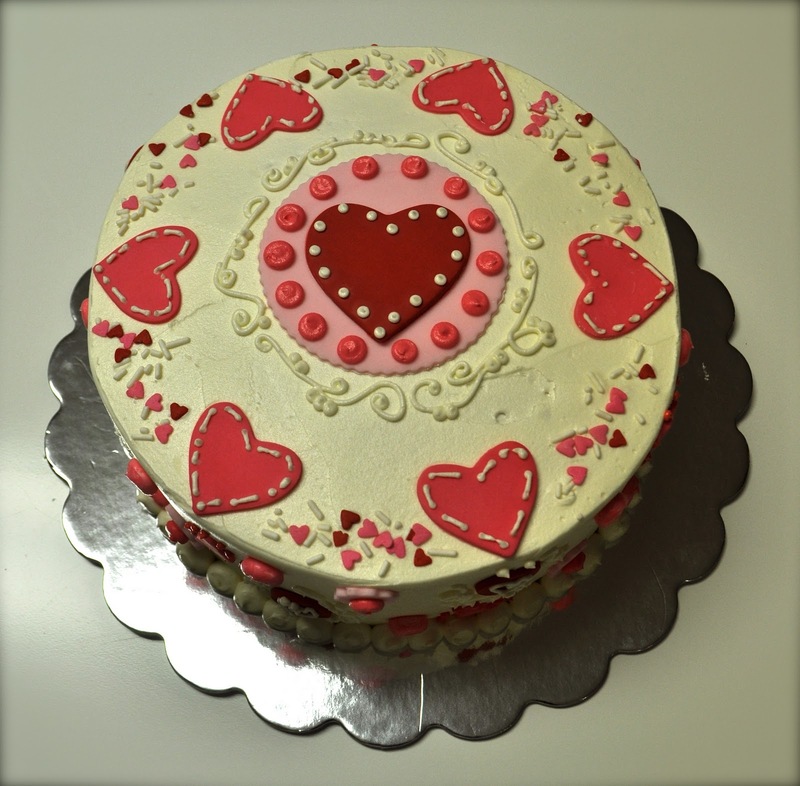 It is a Valentine's Day themed celebration cake! These cupcakes were designed around a Birthday party at the Great Wolf Lodge Indoor Waterpark! The innertube girls are chocolate covered cherry cupcakes with blue buttercream icing. 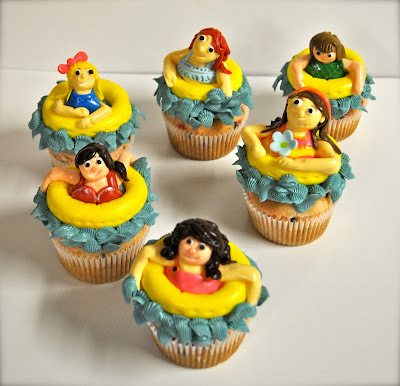 The girls are all made out of fondant. The Wolf cupcakes are marble cupcakes with chocolate buttercream icing. The wolves are all gumpaste handpainted with food coloring. The "12's" are red velvet cupcakes with cream cheese frosting and fondant details.